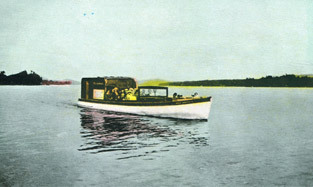 It’s hard for many of us to imagine the early days of travel in the Adirondacks. There were no roads north of Old Forge, and the titans of the American industrial revolution laid railroad tracks to carry them from Utica to the Old Forge lakefront dock. The journey further north to the great camps, hunting retreats, cottages and summer resorts required a series of steamboats, carriages, more rails, and more steamers. In “The Heydays of the Adirondacks,” Maitland DeSormo’s father-in-law, Fred Hodges, detailed in his notebooks how the Clearwater was the first leg of the excursion to Blue Mountain Lake. “By 8:30 in the morning on those red letter days, the people would have gathered on the docks along the Lake. The Clearwater would pick them up and take them as far as Eagle Bay. 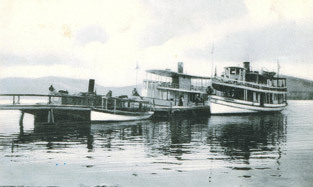 There they would board the train for the ten-mile trip to Raquette Lake, where other steamers waited for them. 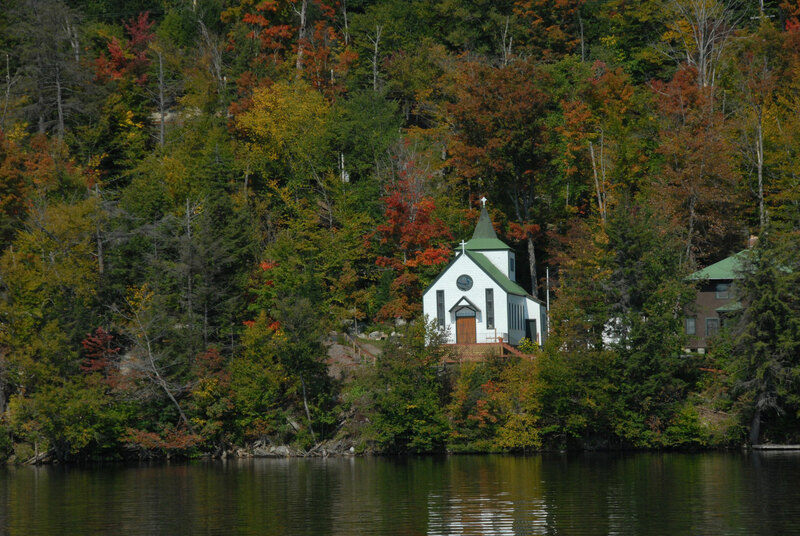 Then came the trip across Raquette Lake, up the Marion River and its hairpin curves to the Carry. Here they would climb into the old Brooklyn open trolley cars and be drawn by the dinky locomotive the half-mile distance to the foot of Utowana Lake. At that point the Tuscarora, the Clearwater’s twin, would take them through the lake and Eagle and past the swinging bridge at the entrance to Blue Mountain Lake. 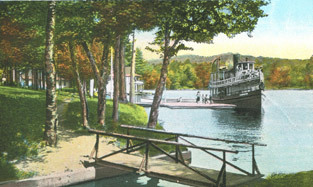 Then came the unforgettable and all too-short trip across that lake to the steamboat landing. The return trip started at 5:00 p.m. Then over the same course in reverse and back to Cohasset Point (on Fourth Lake) by 9:30 or 10:00 p.m.
Now that same five-hour journey into the heart of the Central Adirondacks can be accomplished in just under an hour’s drive. Today, there’s still plenty of nature to enjoy in the Central Adirondacks; hunting, fishing, canoeing, hiking, mountain biking, whitewater rafting and you can get there in half the time. But you can still enjoy portions of the journey our predecessors undertook each summer. Though the tracks no longer reach the Old Forge lakefront, you can still hop aboard the Adirondack Scenic Railroad in Utica and ride the rails through the Adirondack foothills to the Thendara station. Or climb aboard in Thendara for an intimate woodland experience venturing into some of the most pristine and remote areas in the Adirondacks. Be sure to check the schedule or the Loomis Gang might surprise you. 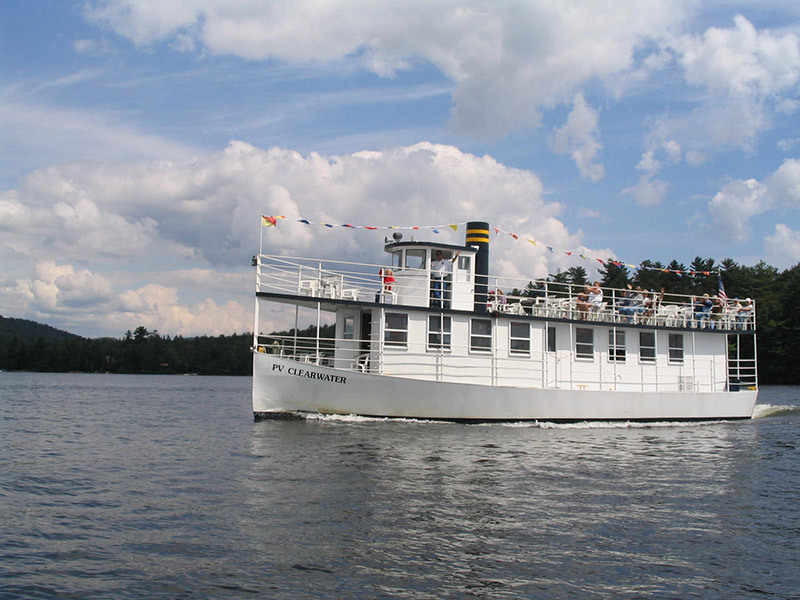 Diesel and gasoline engines may have replaced steam, but Old Forge Lake Cruises is keeping the historic waterway journeys alive in the Central Adirondacks. 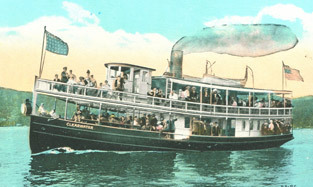 The Clearwater follows the steamers’ old route through the first four lakes of the Fulton Chain. Our 2 hour narrated cruise will point out historic points of interest and great camps, as well as share the history and folklore of this unique region. So take a journey back in time to a bygone era and experience first hand the history and character that built this region.